CIL offers the most complete listing of stable isotopically labeled metabolic substrates available. These metabolic substrates are labeled with 13C, 15N, 18O, D, as well as other stable isotopes. Some of the many applications for these materials include the utilization of amino acids for protein turnover studies, carbohydrates for glucose metabolism studies, and fatty acids for lipolysis research. Stable isotope labeling of these materials allows investigators to study metabolic pathways in living systems in a manner which is safe, accurate and non-invasive. 13C and 15N nuclei are NMR active, and thus compounds enriched in these isotopes allow for magnetic resonance detection. The large chemical shift range and favorable relaxation properties of the 13C nucleus has made 13C-enriched substrates highly valuable probes of cellular chemistry and metabolism, particularly in the rapidly advancing field of hyperpolarisation. CIL recognises the importance of high chemical purity and isotopic enrichment for metabolic studies. For this reason, all products are tested to the meet high specifications for both. All products are shipped with a Certificate of Analysis that indicates the passing results and an MSDS to describe the product even further. CIL may be able to provide additional data upon request. CIL offers different grades of products for your metabolic research. These include research grade, microbiological and pyrogen tested and cGMP grade. An Enhanced Technical Data Package is also available for some products. Please inquire for details. 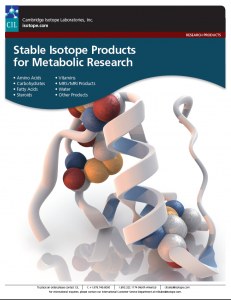 All metabolic products can be found in our online catalogue or alternatively they can also be found in our Stable Isotope Products for Metabolic Research catalogue. 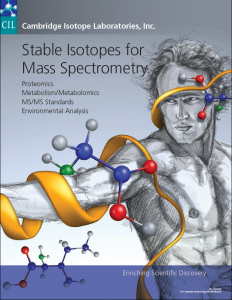 The product group as a whole is also covered in our Stable Isotopes for Mass Spectrometry catalogue. Specific product area pages are listed below and provide additional information and resources for each area. If you have any questions or would like to discuss any element of your metabolic work then please don’t hesitate to contact us. Researchers employ stable isotope techniques to study a wide variety of metabolic disorders and diseases including Alzheimer’s, Parkinson’s, cancer, diabetes, and obesity. Isotopes are most commonly used in metabolism research as tracers to quantify biochemical or metabolic reactions in vivo. They can be used to study metabolic pathways, to determine biomarkers, to test the effects of a drug, and to develop metabolic profiles of biological systems in a particular state. Metabolomics, or the study of biochemical processes involving metabolites, is a relatively new, yet increasingly growing field of research. The use of stable isotopes as internal standards combined with mass spectrometry in metabolomics allows researchers to identify and quantify metabolites in a given biological sample. This information is invaluable to understanding the physiology of an organism and/or its response to a drug, a change in its environment, or other external stimuli. CIL has been routinely manufacturing cGMP products since 1994 and has the capabilities to supply compounds suitable for all different phases of clinical trials. Each cGMP product is manufactured, tested, packaged, and released according to current Good Manufacturing Practice. Customers can be assured that they will receive a wide range of support throughout each cGMP project.